Tipperary defeated Waterford by 2-13 to 0-16 in round 1 of the Allianz Hurling League Division 1A on Saturday February 15th at Semple Stadium, Thurles. Tipperary got off to a winning start against Waterford in Saturday evening’s Allianz Hurling League Division IA opener at Semple Stadium. Without ever hitting the heights, Tipp did just about enough against the visiting Déise, in front of 4,786 spectators in chilly Thurles. Tipp recovered from a disappointing first half display to set themselves up nicely for next weekend’s visit to Kilkenny. At half-time, Waterford were 0-8 to 0-5 up and under new manager Derek McGrath, they were full value for that lead. The margin could have been even greater at the break for Waterford shot eight of their 13 wides in the opening half. On the resumption, Waterford picked up where they had left off as Maurice Shanahan opened the second half scoring. And when Jake Dillon pointed in the 40th minute, McGrath’s men were five points clear, leading 0-10 to 0-5. But Tipp set about eating into the lead and by the 47th minute, they were level as Seamus Callanan, scorer of 1-4 in the second half, banged home a fine goal after taking a clever pass from Noel McGrath. Callanan put Tipp, now playing with the breeze, ahead in the 56th minute from a free and the hosts held on from there until the finish. And Waterford were caught by a 70th minute sucker punch as Tipperary goalkeeper Darren Gleeson netted from a long-range free that somehow found its way past his opposite number Stephen O’Keeffe. Scorers for Tipperary: S Callanan 1-4 (2f), J O’Dwyer 0-4 (4f), D Gleeson 1-0 (1-0f), N McGrath 0-2, J Woodlock, K Bergin & D Maher 0-1 each. Scorers for Waterford: Pauric Mahony 0-10 (9f), Philip Mahony 0-2, Kevin Moran, J Dillon, M Shanahan & B O’Sullivan 0-1 each. TIPPERARY: D Gleeson; C Barrett, C O’Mahony, M Cahill; S McGrath, P Maher, C O’Brien; B Maher, J Woodlock; S Callanan, N McGrath, K Bergin; J Forde, P Murphy, J O’Dwyer. Subs: L McGrath for Forde (43), D Maher for O’Dwyer (49), S Bourke for Murphy (56), R Maher for Woodlock (59). WATERFORD: S O’Keeffe; B Coughlan, S Fives, N Connors; J Nagle, M Walsh, Philip Mahony; K Moran, S O’Sullivan; J Barron, Pauric Mahony, J Dillon; M Shanahan, S Walsh, B O’Sullivan. Subs: S Molumphy for S Walsh (48), S Prendergast for Dillon (58), E Barrett for Shanahan (67), S Roche for S O’Sullivan (70). Only the New Stand will be open and admission on the night is €15 but tickets can be purchased in advance for €10 at any of the usual Supervalu or Centra retail outlets around the county (No concession on these). Tipperary supporters have purchased 1200 GAA Season tickets to date so a crowd of up to 4000 is expected on Sat night. With no curtain raiser the message for non ticket holders is to come early and avoid the queues as tickets must be purchased at the ticket booths before going to the stiles. Patrons should note the following stile allocations; Season tickets at stiles 48 to 51, Player passes at stile 41, Juveniles including Groups at stile 45, Concession refunds at stile 52/53. The Tipperary Senior Hurling team to play Waterford in the Allianz Hurling League on Saturday next at 7pm in Semple Stadium Thurles has been announced. Right corner-back Cathal Barrett from the Holycross-Ballycahill club will be the sole League debutant in a team captained by midfielder Brendan Maher. In total, there are 7 changes to the Tipperary team which captured Waterford Crystal Cup honours last weekend. Tipperary manager Eamon O’Shea has also named his 26 man panel for the Allianz Hurling League. The panel will be subject to changes as required during the group stages of the competition. 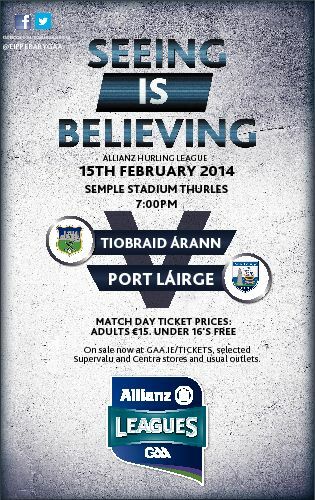 Waterford Team to play Tipperary in their opening Allianz Hurling League Game on Saturday night next in Thurles. This entry was posted on Saturday, February 15th, 2014 at 9:00 pm and is filed under events, News. You can follow any responses to this entry through the RSS 2.0 feed.